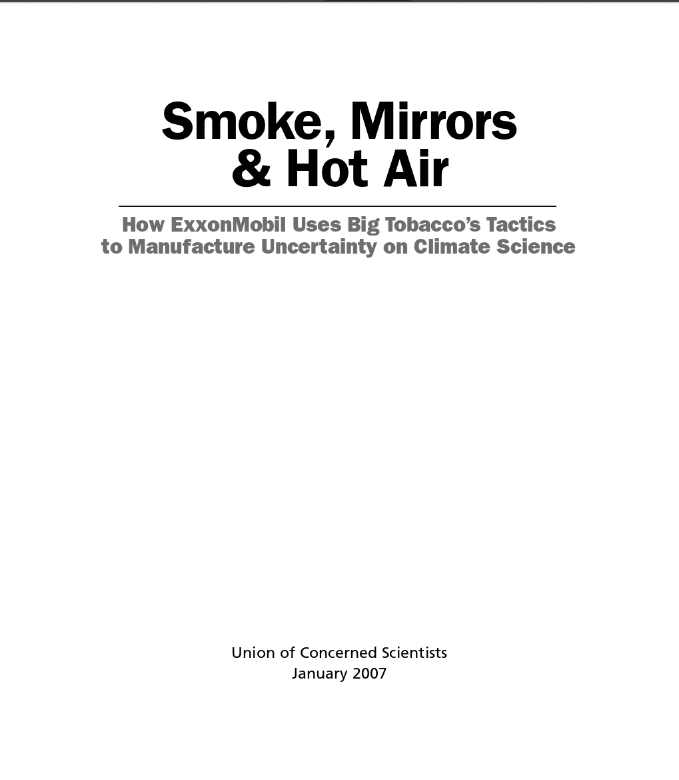 On January 3rd 2007, the Union of Concerned Scientists released a report called “Smoke, Mirrors and Hot Air”, detailing the malign influence of Exxon on the Bush Administration. Context: The Union of Concerned Scientists was established in 1969 by MIT faculty and students. Through the first dismal decade of this century they, and Greenpeace and other groups were documenting in report after report, the actions of various front groups seeking to sow seeds of doubt, censoring scientists and generally causing perceptive observers to start doubting that the species is smart enough to get out of the mess it has created. The previous decade hadn’t exactly been much fun either; see Jeremy Leggett’s “The Carbon War” for an account of the success that the oh-so-sadly defunct “Global Climate Coalition” and “Climate Council” had in slowing international action during the crucial years of the 1989 to 1997. And who read those reports? What was their effect? It’s hard to say, but if they hadn’t been written and distributed and digested, we’d possibly be in even more of a mess than we are now. Oreskes, N. and Conway, E. (2010) Manufacturing Doubt : How a Handful of Scientists Obscured the Truth on Issues from Tobacco Smoke to Global Warming. London: Bloomsbury. Hoggan J. with Littlemore, R. (2009) Climate Cover-up: The Crusade to Deny Global Warming. Vancouver: Greystone. Leggett, J. (2001) The Carbon War: Global Warming and the End of the Oil Era. London: Penguin. 1961 A core explosion and meltdown at the SL-1, a government-run reactor near Idaho Falls, Idaho, kills three workers. 1997– China announces it will spend US$27.7 billion to fight erosion and pollution in the Yangtze and Yellow River valleys.